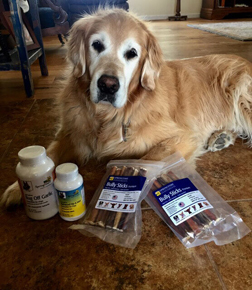 Bully Sticks - Premium | Treats for Dogs | Springtime, inc. 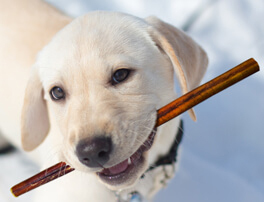 Dogs give two paws up for these low-odor, long-lasting bully sticks! A delicious treat for dogs of any size! Our free range Premium Bully Sticks are low odor and extremely tasty. Denser and longer lasting than our Choice Bully Sticks, the Premiums are tough enough to give the big chewers some time, yet still chewable for smaller mouths. Premium Bully Sticks are food-grade, triple washed and hung vertically to cook, ensuring minimal odor. Springtime's line of long lasting, natural, USDA Inspected Bully Sticks encourages healthy chewing habits as well as keeping dogs happy and occupied (making us dog owners' happy as well!). And Springtime Bully Sticks work great as a dental treat, keeping gums and teeth healthy without additives or sugary carbohydrates. Our Bully Sticks are made without preservatives or dyes. A safe alternative to products like rawhide, our lines of Bully Sticks are 100% digestible, low in fat, gluten free, and a good source of protein. I love when my Springtime products arrive at my house. The Premium Bully Sticks are my favorite!